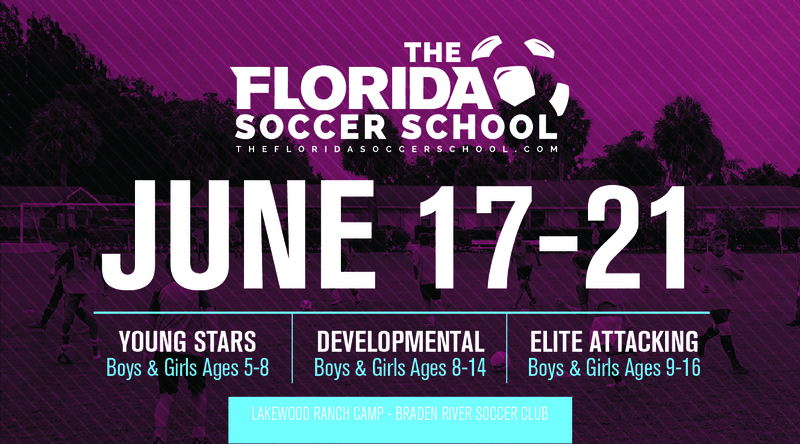 The Florida Soccer School offers three programs at Lakewood Ranch Park - (6/17 - 6/21)! The Florida Soccer School is excited to offer three different Day Camp Programs again this summer at Lakewood Ranch Park, from June 17-21! The Florida Soccer School does a great job of teaching and providing elite instruction to players of all ages and skill levels. They have a great staff comprised of former collegiate coaches and professional players who will work to build your child's technical ability, confidence and love for the game. Young Stars Camp - A half day program designed for beginners, recreational or younger players ages 5-8 years old. All players at our Young Stars Camp will learn important techniques and have FUN! Developmental Training Camp - Is a full day that is ideal for players ages 7-14 that are still developing and refining key techniques. This program is designed to improve your child's comfort and confidence with the ball to help prepare them for the next level in soccer (competitive, club, or middle school team). Elite Attacking Camp - Is a full day program that is specifically designed to improve the competitive, club or academy player's attacking methods and ability around goal. The Florida Soccer School really does their best to teach players at every level so they walk away with new skills, techniques and a love for the game.